The Bissell Powerfresh Steam Mop 1940 is a very popular and in demand hard floor steam cleaner. In my opinion this is the best steam mop available. Let’s take a closer look at its features as well as the positives of this machine that makes it so popular. We also look at the negatives that you need to know about. It not only cleans but sanitizes and can be used on tile, marble, stone, sealed hardwood, ceramic and even laminate and linoleum floors. No cleaning solution or chemicals are needed as steaming alone kills bacteria, mold and germs. You will never have to worry about your toddlers playing on the floor picking up germs after cleaning with this steam mop. The 15 oz water tank is removable for easy filling and can be refilled anytime during use without having to wait for it to cool down. It is recommended that you use distilled water instead of tap water to prevent mineral buildup in the machine. Control how much steam you are using for specific tasks by using the Low, Medium or High digital control settings. The indicator light will stop blinking when the steam is at the right temperature to be ready for use. The low shape design of the mop head, that is 12,5 inches wide, makes it super easy to reach under furniture and into corners and to clean edges. It features a swivel head. 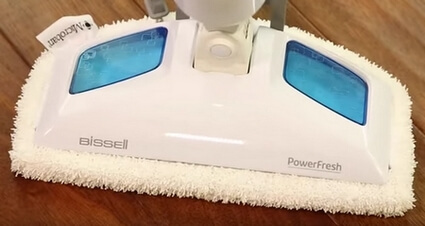 Two washable microfiber mop pads are included with the Bissell Powerfresh Steam Mop. The one pad is for everyday light duty use and the other, that is more coarse and have scrubbing strips, is ideal for more heavy duty cleaning. At the back of the mop head is a removable scrubbing brush that can be pushed down with your foot to add scrubbing functionally to your mop. The easy grip handle is shaped in such a way that you can comfortably mop without hurting your back or tiring your arm. The 23 feet power cord can conveniently be stored by using the handy quick release cord wrap on the back of the handle. If I have to describe the Bissell Powerfresh Steam Mop in one word it will be with the word ‘easy.’ Everything about it is easy and simple. The water tank is easy to remove and refill and there is no need to wait for it to cool down first. You can immediately start steaming again after refilling. Sort hard to clean sticky or caked in dirt out with ease with the help of the build in Easy Scrubber brush at the back of the mop head and by using the scrubby microfiber mop pad that was especially designed to tackle the harder to do jobs. 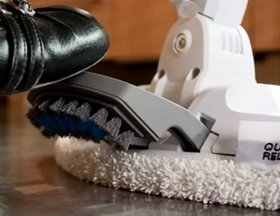 The scrubber is easily flipped down with you foot when you need to scrub something (think grout) and can even be removed and put back when you want to give it a good clean. The SmartSet Steam Control setting on the handle makes it possible for you to choose the amount of steam you want to use. Use the Low setting for everyday light cleaning, the Medium setting for easy to clean spills and messes and the High setting for tough dirt. Flip the scrubber brush down for an extra cleaning punch when dealing with difficult to deal with dirt. Even though the Bissell Powerfresh Steam Mop is lightweight it is sturdy and made of quality materials. If you run into problems or breakages replacement parts are easy to find. (See bottom of this page) It moves around easily, the cord winds onto the quick release cord wrap on the handle and storage is a no brainer. You have a choice of two steam mop pads to use. The first one is for everyday use and made of microfiber and looks like towel fabric. The second pad has scrubbing strips and is perfect for the harder to do jobs. The pads are both re-usable and can be machine washed although it is recommended to dry them naturally. Slip a scented disk (or half disk) into the small pocket on the inside of the pads for a clean fragrance while you are steaming if you like your floors to have a fragrant smell. Get your Bissell Powerfresh Steam Mop 1940 here! The Bissell Powerfresh Steam Mop produces real steam that is hot enough to burn. Know that lingering on one spot of your floor will leave that spot hot for a while and can burn your feet if you are barefooted. Be careful when you flip the Scrubber brush down with your foot as the steam is hot and may burn. Some customers complained that the cap on the water tank broke in two after a while and had to be replaced. This is something that can easily be done by yourself. You will find links to replacement parts at the bottom of this page. Bissell’s costumer service is outsourced to countries where English isn’t well understood and some customers complained that they had difficulty making themselves understood and getting service. 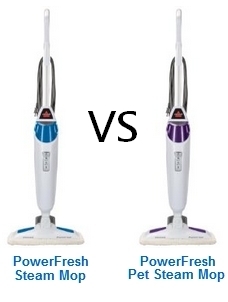 What is the difference between the Bissell Powerfresh 1940 and the Bissell 19404 PowerFresh Pet Steam Mop? They are exactly the same except that the Powerfresh 1940 is white and blue and costs $84.55 and the Powerfresh Pet 19404 is white and purple and costs $88.98. *Prices (Amazon) were correct at the time this post was written.